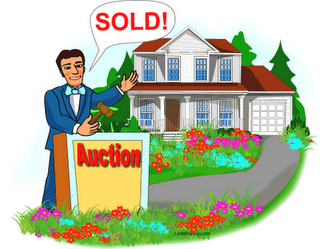 Do buyers overpay at auctions? Last week, I took a buyer to a local "Williams & Williams" auction where they were selling 4 properties. The auction was done live on the front lawn of one of the properties and buyers could also participate online. If you haven't seen Williams & Williams auctions, check out their Auction Network site which shows all the current auctions they are running. I think they do a nice job. We were both surprised at the prices each of these properties received. My buyer is a well seasoned investor and we did our research to know the right price to pay and still be able to make a profit in this market. In every case, the property went for at least $10,000 more than we thought it should. One of them went for close to the list price in the MLS (crazy when you consider the buyer could have bought the property months ago before it was taken to auction). This was the 4th Williams & Williams auction I've attended locally and once again it proved to me that when the auction is marketed correctly and done right, there isn't a better way to sell. I hope you're seeing the same success in your market.